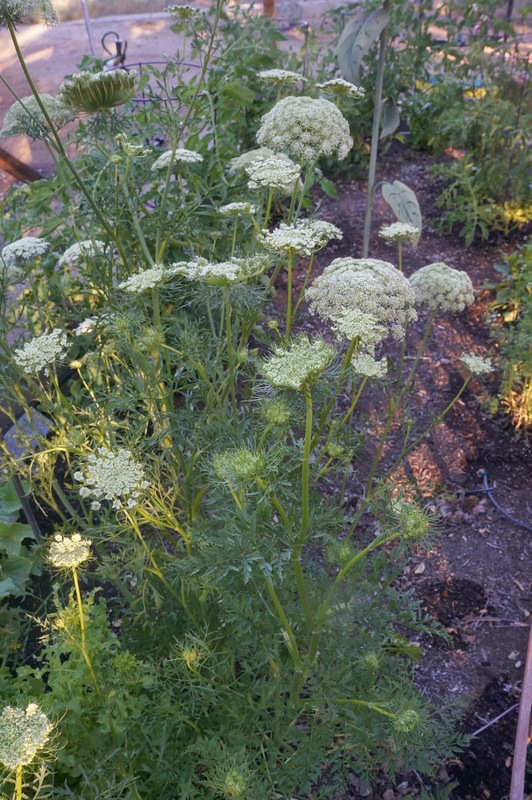 Just writing a post about our vegetable garden. I have been sick with a summer cold and I haven't felt like doing anything. My wonderful hubby created our garden space. He made it squirrel proof by adding wire mesh under the garden beds and whole garden and filling in with decomposed granite. The next thing he added was a shock wire to the top of the fence. It will just stun the little critters. The first year we had a garden with no fencing, we had lovely lettuce growing and when I looked the next day, it was like a lawn mower came through. Those squirrels had a feast. 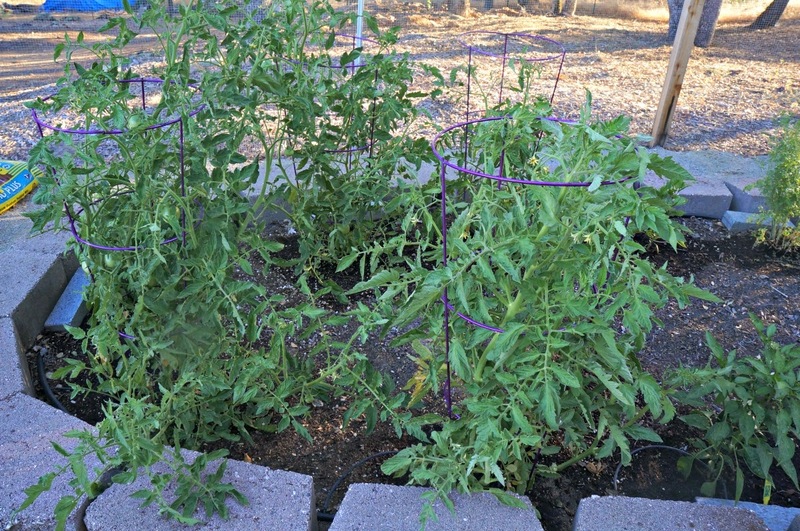 I hope we get some nice tomatoes this year. 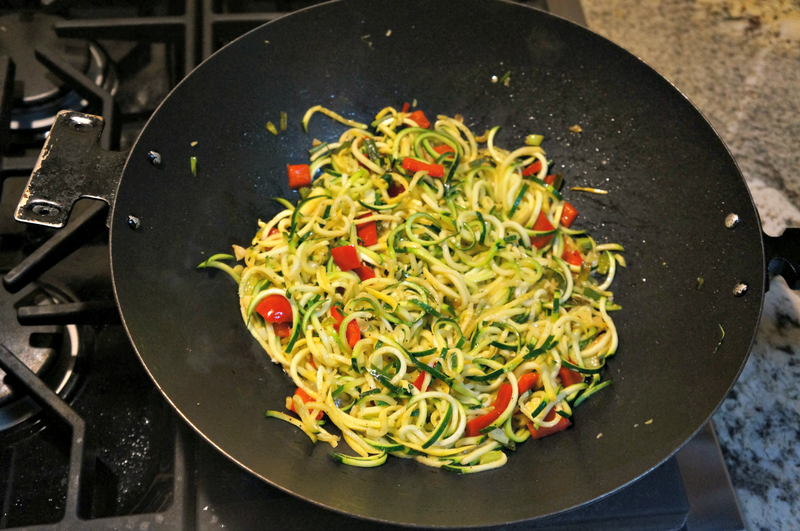 Zucchini for that that awesome stir fry. 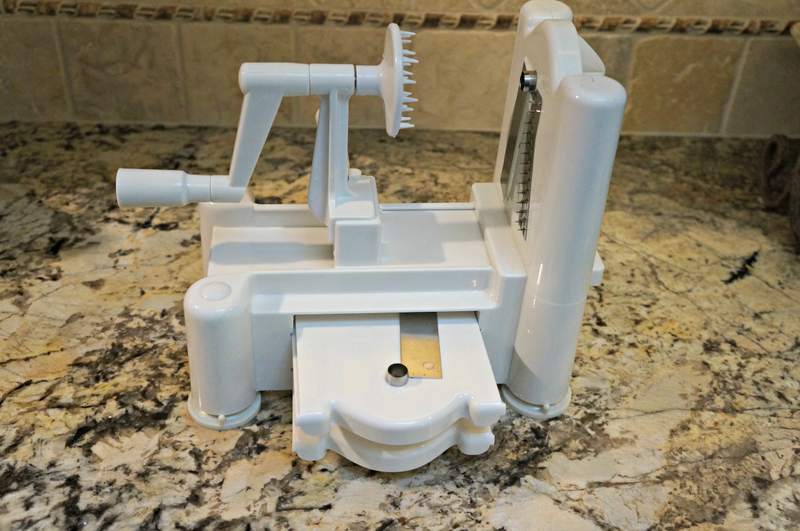 The Paderno Spiralizer is amazing! My husband even likes zucchini now, made into spagetti like shapes. Some colorful flowers to make the garden pretty. 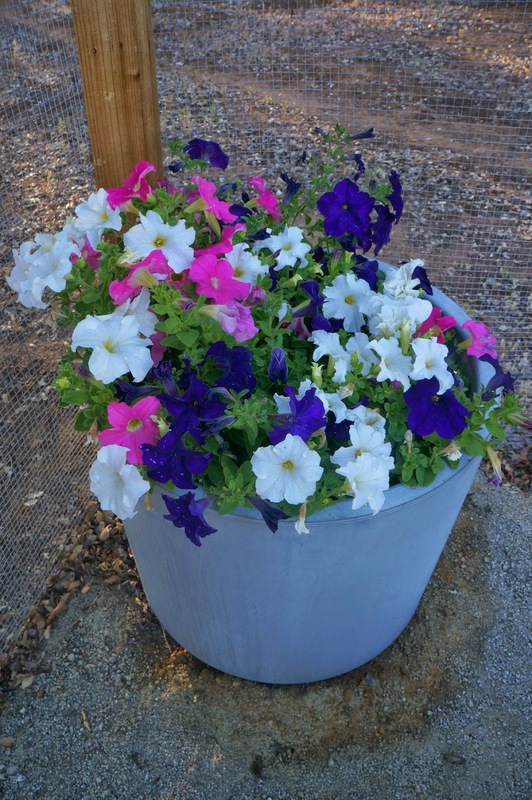 I love petunias. These are carrots. They were from last year's garden. They were very small, so I just let them go. 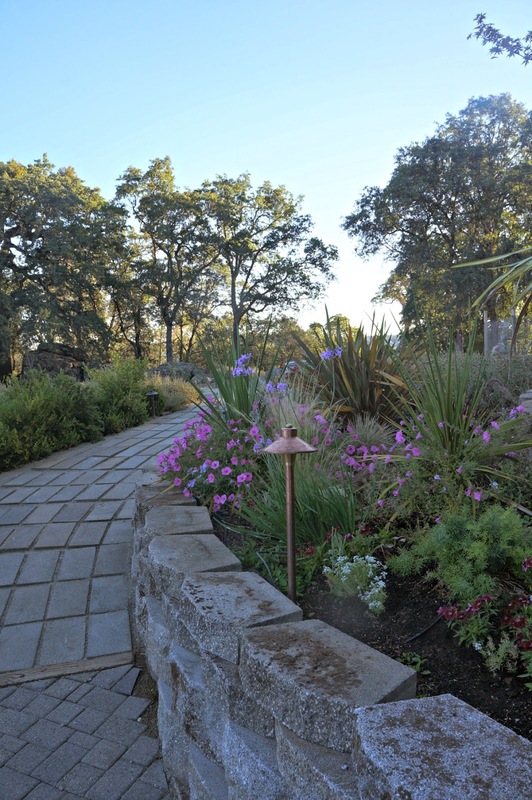 Walkway leading to our veggie garden. Of course my husband created all of the retaining walls and pavers. Multi-talented.....and so handy. Great job honey! If we painted the pavers yellow, we could have a yellow brick road, or path. Just about ready to reveal Patti's new blog design. Beautiful Linda. 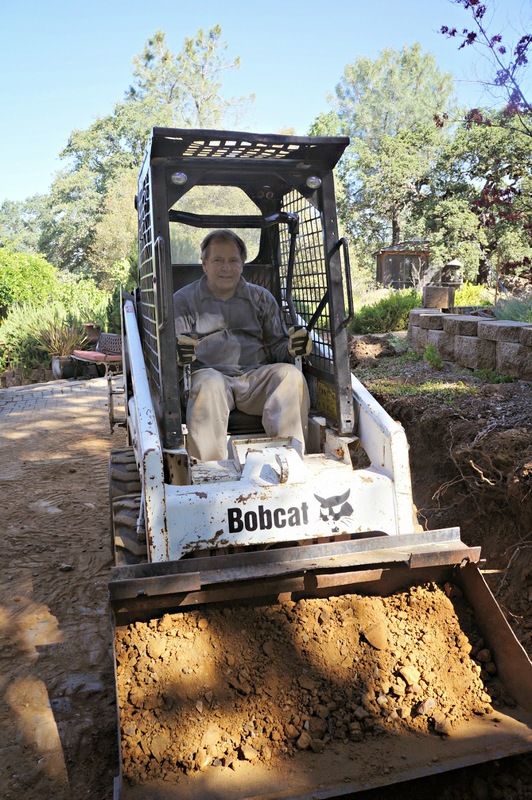 I am coveting your Bobcat. I have some work for it to do here. We have a vege garden this year but it has been so wet that things are not popping up like they should. gloomy and damp again today. Pray for sun. What a delightful garden! I love how very creative Becky's projects are. So fanciful! There's really a lot of inspiration in these gorgeous pictures. Brenda, such a fun site to find! 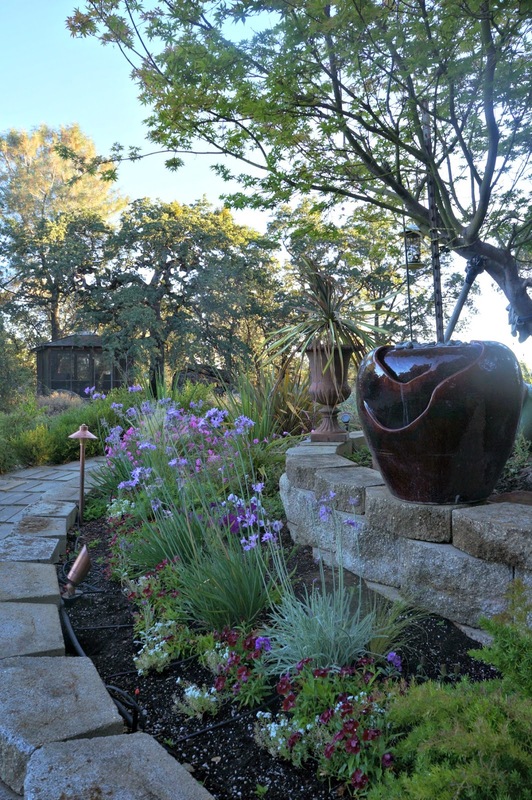 What a gorgeous garden! Better Homes & Gardens worthy, in my opinion! 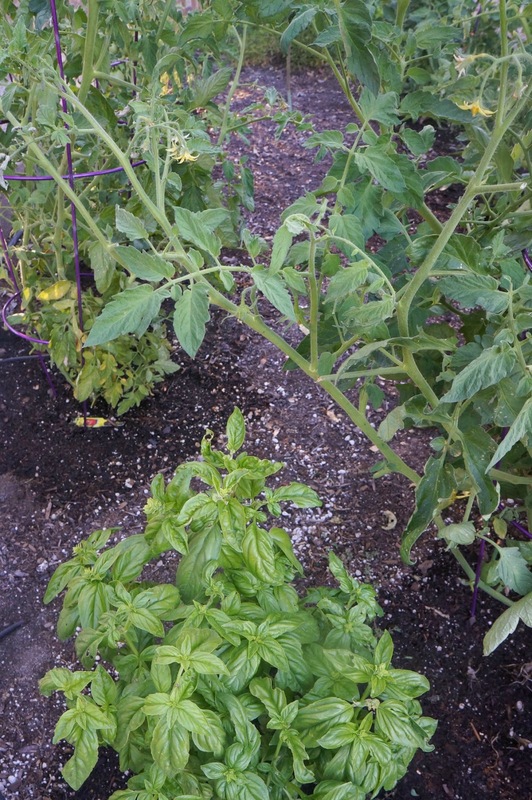 And with all that basil and tomatoes, I see much pesto and caprese salad in your future. Wish I lived close enough to pop by for lunch. I'm loving what you're doing with my blog. You are awesome! Ahh everything looks good! Lucky you having veges that far along. I hope your cold goes away soon! 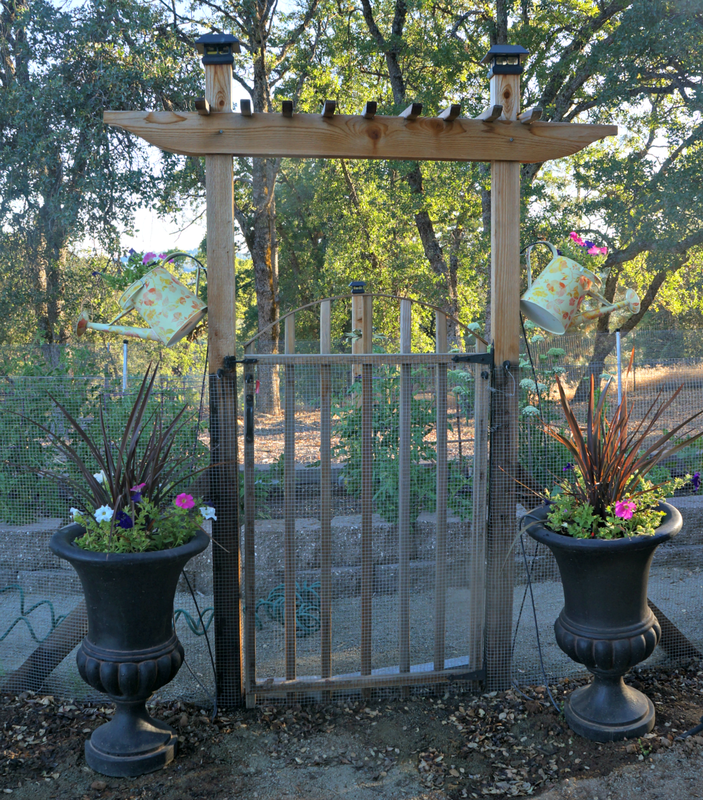 The gated entry is very cute! What a beautiful garden! You'll be having lots of wonderful veggies in no time! Wow! 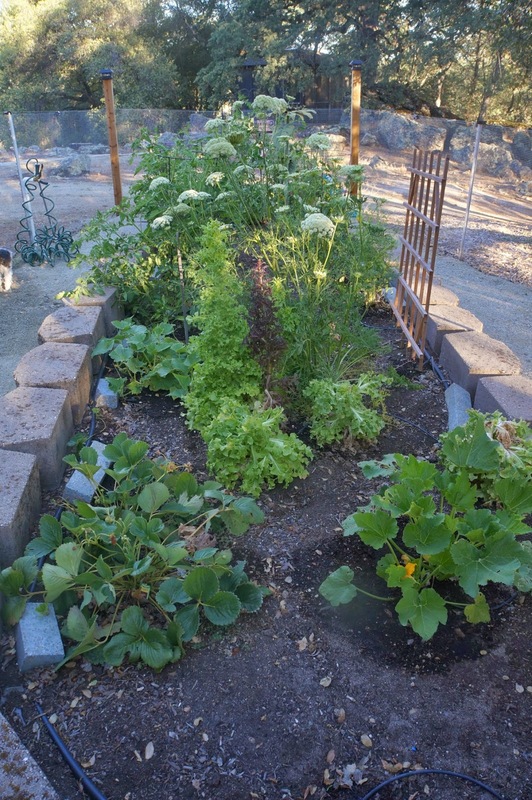 Linda, your veggie garden is wonderful and I like all your photos! There's nothing better than FRESH vegetables straight from the garden. Those cherry tomatoes that are warm from the sunshine are my favorite. Love your garden, Linda, and what a sweet hubby! I'm still thinking of getting a spiralizer, but wonder if I'd use it enough. 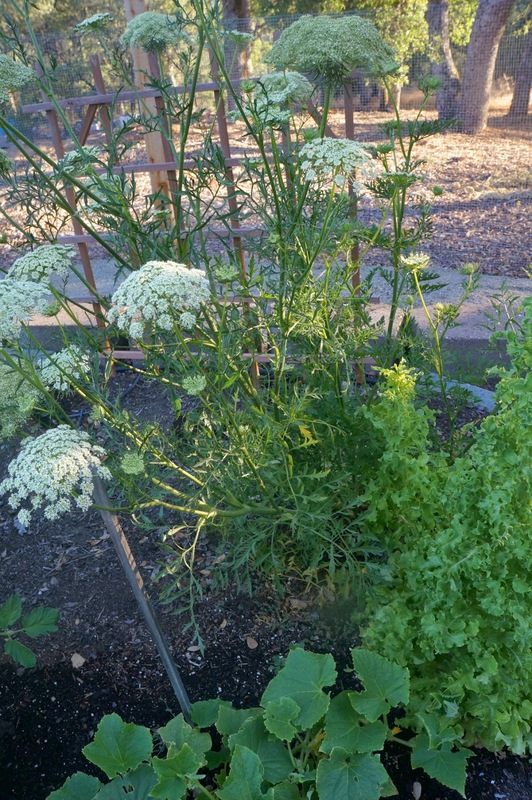 Hi Linda, Your veggie garden is wonderful and the carrot blooms look a bit like yarrow. 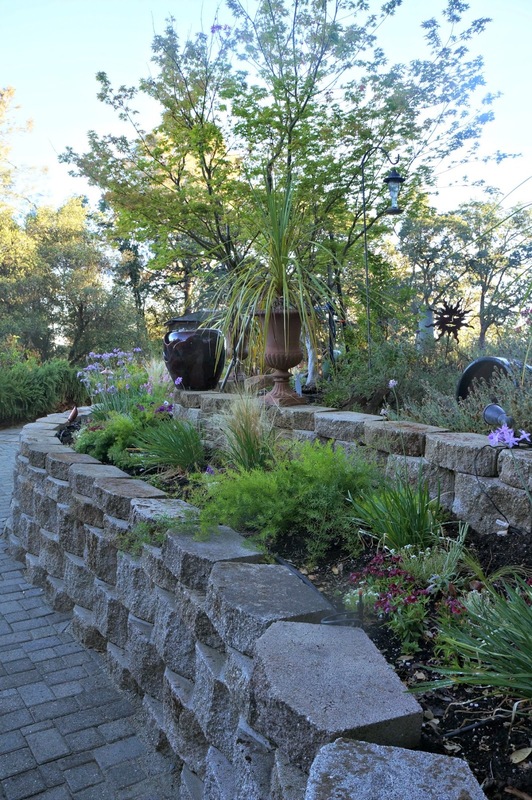 The retaining wall and pavers is gorgeous. Your hubby did an incredible job. I know the work involved as we have a brick retaining wall around the backside of our pool and just did a flagstone side patio. 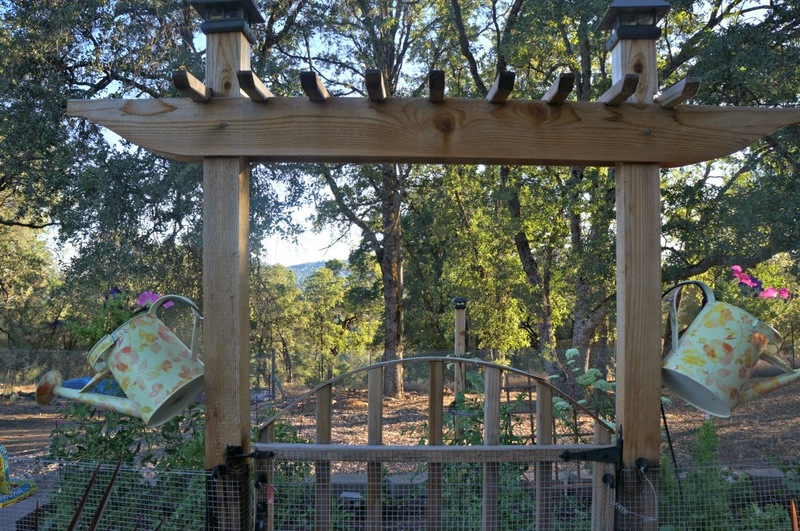 We don't have a vegetable garden, but if we did I would want your husband to engineer it!!! Wow! He's thought of everything! You should have lots of fresh goodies for the table all summer and into the fall! The garden is beautiful. And yes, your hubby is quite handy and talented!! Beautiful veggie garden and loved the matching watering cans. Everything is perfect right down to the last detail and last flower on every plant. You hubby looks a great guy and has a kind face - would loveto have a beer with him and a drive in that digger.